The chronology, which dates from March 2013 up until the present, is now at the top of this page. It is followed by a list of texts with links from December 2008 until more or less the present, and includes also events preceding March 2013, which the chronology dates from (scroll down to the bottom of the chronology for this list). This is a list of links taken from my “news of opposition” page together with comments placed in reverse chronological order up until March 2013. 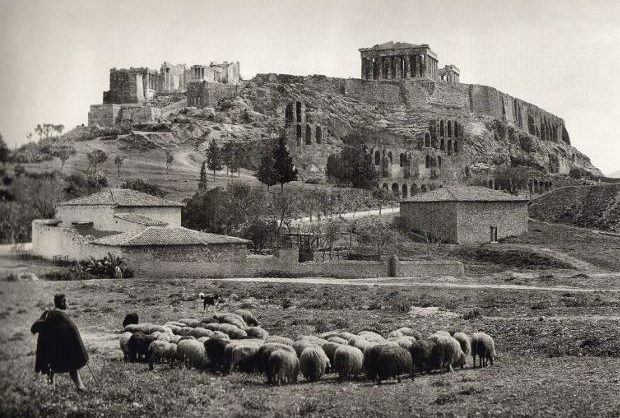 Greece, Athens: philosophy realised and suppressed…? Greece, Athens: cops beaten as workers break into Labour Ministry in protest against new strike restrictions Video here. Though this mainly involved Communist Party workers (notorious for opposing riots, occupations and strikes not under its control over its history, including the last 9 years), coming on the eve of the 9th anniversary of the assassination of Alexis Grigoropoulos might make for some unusual developments…though this is probably just wishful thinking. 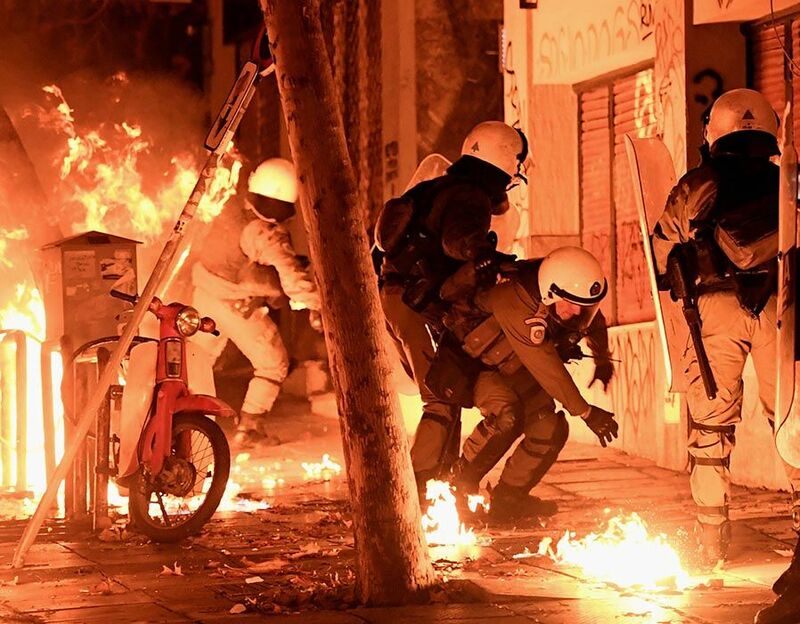 Greece, Athens: cops attacked yet again in Exarchia Apparently this is a bit of a ritual there: the only cops in the area guard the Socialist Party (PASOK) building, and they – from time to time – are the object of attack. 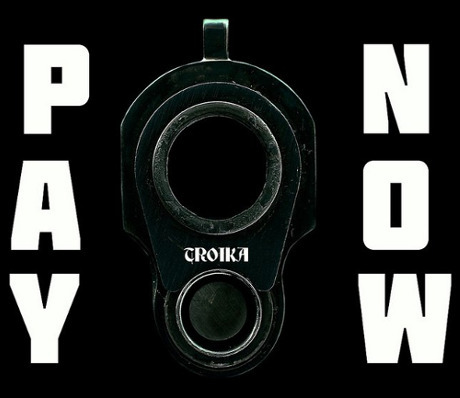 A lot of cops don’t want Exarchia to remain the virtual no-go area that it is, but the government doesn’t think it’s worth the bother to push them to end this largely cop-free zone, as it would provoke a massive, and fruitless, confrontation with the world-famous “anarchist ghetto”. Greece (Lesvos): volunteers working to save stranded migrants arrested after saving a boat. Greece: hunger and medication strike in Greece infamous Korydallos prison, where many anarchists are held. SamFanto: Though almost anywhere else conscripts making a statement like this is virtually unheard of, apparently this is not that unusual in Greece, which has a tradition of far leftists accepting being conscripted and forming some kind of opposition within the army; anarchists, however, are far more likely to find ways of avoiding the army by having themselves declared mentally unstable or whatever. through the land border with Turkey are much lower. contact and agitate amongst military conscripts. trajectory in the milieu with such an act. (something like 5 euros per month). its proportions which are rather narrow. Greece, Athens: strikers on trial This article calls them “unionists”, but certainly not all (if any) of them have a position within the union. 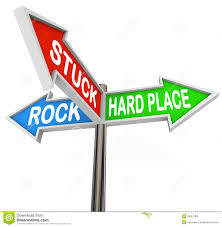 For the last five years, the policy of devaluation not only of our labour power but also of our life as a whole (also known as the “Memorandum”) has been relentless and inexorable. It is served and promoted both by the Right wing and the Left wing of the state and capital. *note: Spiros Latsis owns 42% of Hellenic Petroleum. 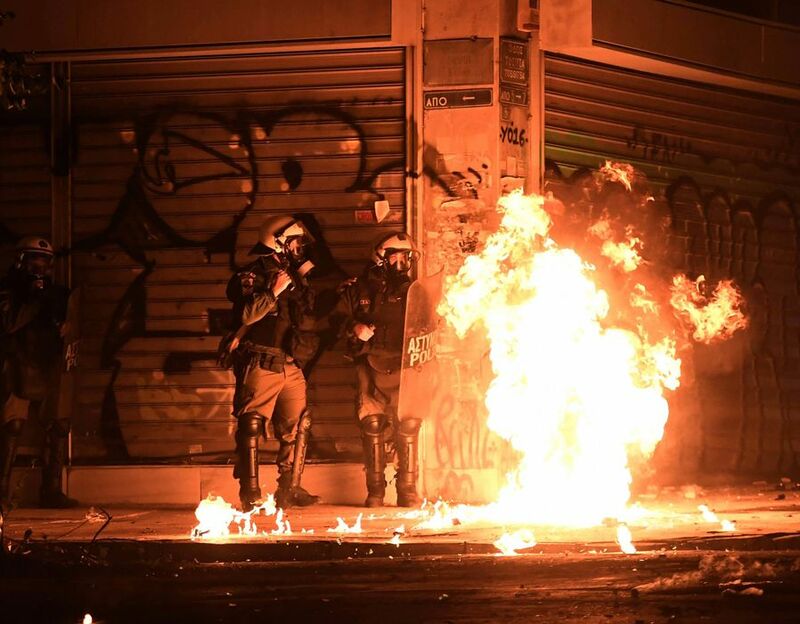 Greece, Athens: anarchists continue rioting A Greek friend writes: “…the anarchists played a good game with the limits of the new soft policing strategy of the state. Whether they have managed to gain something I don’ t know because the new law on prisons will probably pass next week. Unfortunately, because of their avant-guardist mentality, they were unable to connect with anybody outside of the anarchist milieu.” The group of prisoners the anarchists were rioting in support of come mainly from Revolutionary Struggle. This group has, in meetings, expressed its opposition to looting, saying that a social movement would have to violently prevent the next insurrection from having the looting that characterized part of 2008. 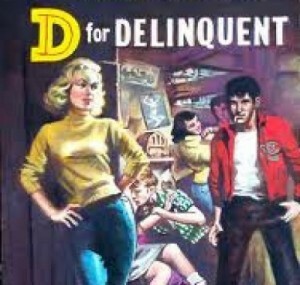 This isn’t so foreign to the Greek anarchist scene. Someone got burned (literally) when he started looting during the 2003 riots in Thessaloninki – not out of hostility, but because the crowds throwing molotovs couldn’t imagine someone would go inside the shops to take things instead of just destroying the temples of commodity-democracy. On the other hand, on hearing this from a leading light of Revloutionary Struggle, some anarchists were horrified by it. Presumably there are also full-time support people for the Revolutionary Struggle prisoners who also felt opposed to their, essentially Leninist, stance on looting (see, for instance, these hilarious moralistic comments by Demogorgon303, Alf and other ICC people from here onwards, about the “looting” of stuff washed up on the shore of a Devon beach after a shipwreck in 2007). Of course, in an insurrection where the state and the market has suffered a major defeat and forced to massively retreat, the organisation of the distribution of things under a proletarian democratic form will involve suppressing looting as this could be done by little survivalist gangs or even remaining sections of the elite at the expense of the general interest, but this was not what Revolutionary Struggle had in mind. (My thanks to H about most of this about the Greek group Revolutionary Struggle). 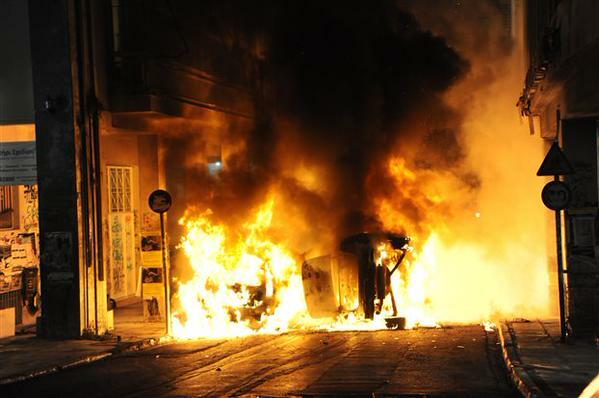 Greece, Athens: solidarity demo for anarchist prisoner on hunger strike – overturned bus, burning cars used as barricades, National Bank attacked, etc. 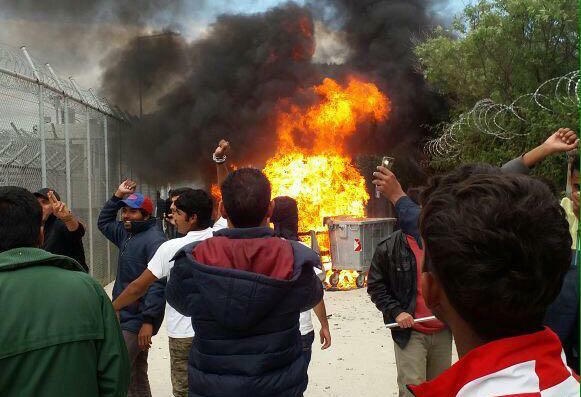 Greece: call no lager – a pdf of a call out from comrades in Greece about the upcoming trial of the migrants accused of the uprising at Amygdaleza detention center in Athens. 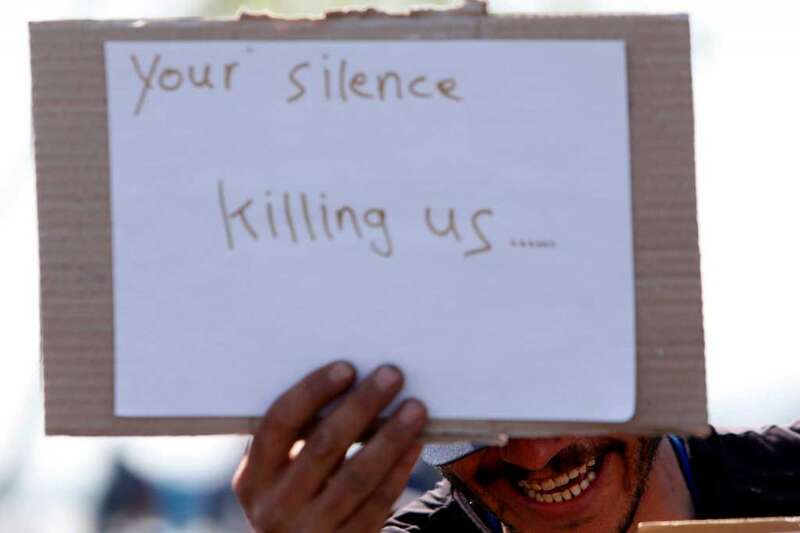 The Amydgaleza uprising of August 2013 is a major event within a continuum of migrant struggles against detention centres, which consists of revolts, frequent hunger strikes and even actions of self-harm. This is why we believe that the trial of those accused of the Amygdaleza uprising is of extreme importance, and it is essential that it gains broader attention. This is a call to initiatives abroad, asking for their support in any way. 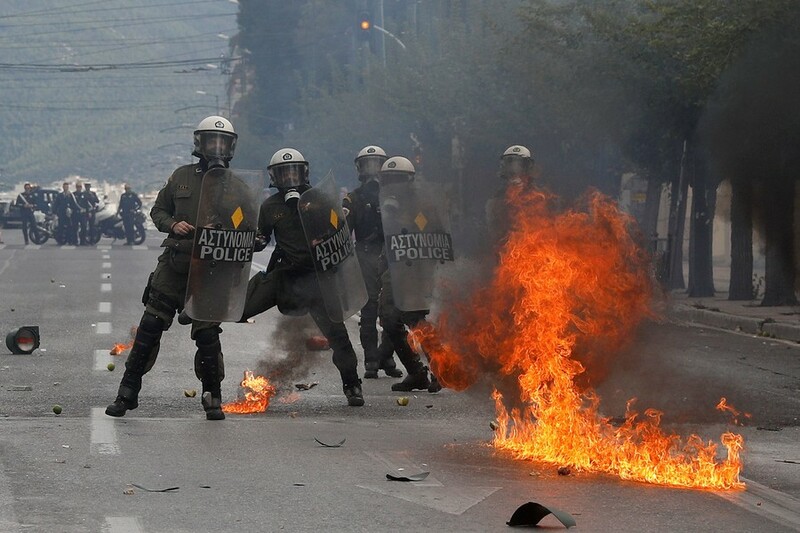 Greece: 24 hour official general strike Apparently some of these strikes are breaking out of the unions’ hold. For instance, in Athens at the University, there’s been a strike of all the various sections of state employees for 9 weeks and they often refuse and confront the bureaucrats’ directives, and make links outside of the university. More on this when I get more information. The current debt crisis tends to be seen purely within the terms of economics and politics in its most obviously conventional forms. Even by those opposed to SYRIZA and the state. 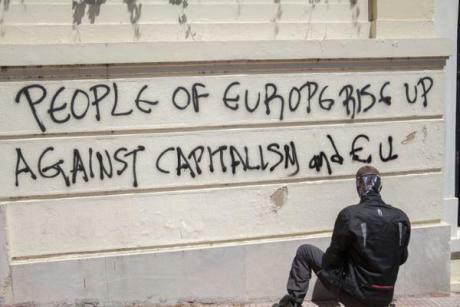 But one of the factors in the brutal punishment of the Greek proletariat which is rarely talked about is to wipe out the memory of what happened almost 7 years ago, to show the world that rising up against the economy and its state will inevitably lead to terrible unending hardship. Of course, the only “inevitability” comes from the fact that the movement in Greece had an insufficient influence on proletarians in other countries – it didn’t subsequently inspire a worldwide movement capable of subverting the world of wage labour and commodity production. Nor did this movement, generally speaking, lead to a subversion of the world of work within Greece – workers hardly came out on strike and Leftist ideology and control of the more traditional forms of class struggle ensured that the movement remained largely outside of the world of work (though one could add that many anarchists and other anti-authoritarians had no interest in making connections with workers in their work situation). The following is a list of texts that deal firstly with the uprising of December 2008 and subsequent movements, leading up to the recent spectacle of the referendum and the complete and utter acquiescence of the SYRIZA government. It’s a bit of a lazy method on my part – so far, I have no synthesis to make of all this. Rather, for the moment all I’m doing is providing people reading this with the facts and analysis that could help towards an understanding of the situation that could help future movements, but I’ve only done so mainly by linking to texts and newspaper articles. Hopefully, this will help the reader to do their own research. It’s well-known that in December 2008, a great uprising spread throughout Greece, catalysed by the murder of a young 15-year-old guy (Alexandros Grigoropoulos) by a cop: riots in at least 15 towns; attacks with molotov cocktails and stones on 35 police stations in Athens, and against a lot of other police stations elsewhere; shops looted everywhere, especially large supermarkets and luxury shops; banks attacked everywhere; occupations of 800 high schools and 200 universities; occupations of several town halls and prefectures, of radio and TV stations, and of some local newspapers, of theatres and of some trade union offices and revolutionary texts criticising this stupid brutal world distributed everywhere, etc. etc. Just as the French Minister of Education (Darcos) in December decided to postpone the reforms planned for the high schools for a year because of the riots in Greece (without saying it was because of this, but it was obvious), the media thought that it would be more prudent this year to remain silent about the movement in Greece. 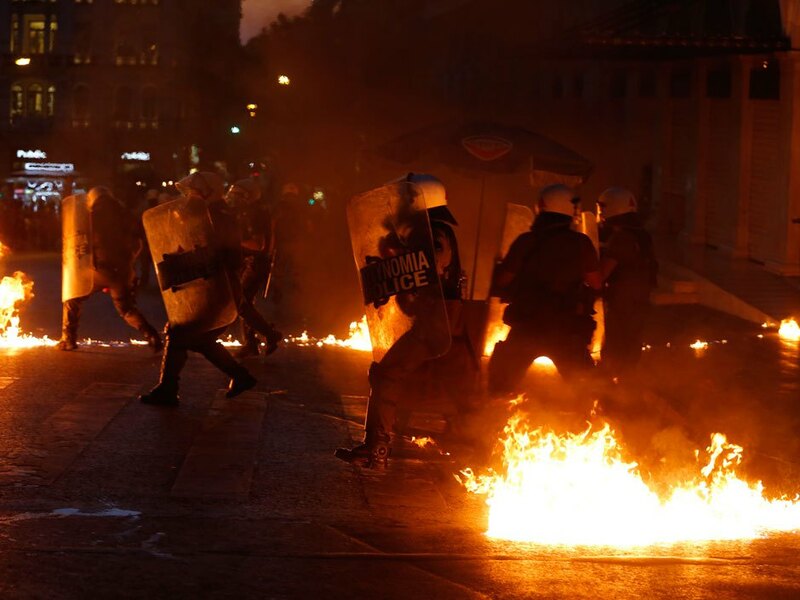 According to the media, almost nothing has happened in Greece since the uprising. In December, there were demos in solidarity with the Greek movement, sometimes violent, including occupations of Greek embassies, in more than 100 towns throughout the world. The fear of the ruling world that what happened in Greece could have an influence elsewhere (and certainly not in solidarity with other movements: solidarity begins at home) shows that the media likes to mainly speak about the misery and idiocy of this world but very little about the opposition to this horror. As a contribution towards breaking this repressive silence, we have made a list here of some aspects of the movement since December (it’s true that the movement after December didn’t reach the same intensity, but it continued). There were at least 62 universities occupied and open to everyone (not like what often happens in France, where often occupations remain corporatist, only for the students). There were also some high schools occupied, particularly in reaction to punishments inflicted on pupils who had participated in the movement in December. The employees of the water company in Thessalonika went on strike against privatisation and against the corruption of the bosses, occupying the company’s building (even if they are threatened and intimidated by the bosses). 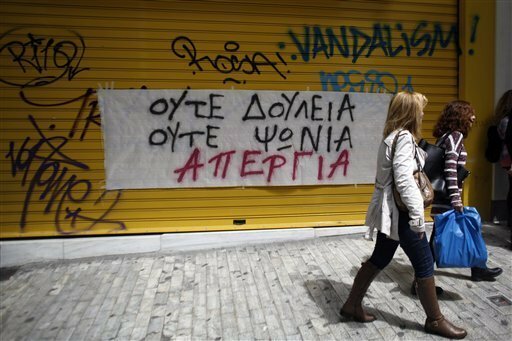 The building belonging to the journalists’ union was occupied by youths and by media workers (Athens). A town hall cafe was occupied by anti-authoritarians, so as to use it as an open space for counter-information, for discussion and for the co-ordination of actions. The threat (and not just the threat) of a big demo managed to force the cancellation of the transport of American arms destined for Israel (during the massacre in Gaza) through the private port of Astakos on the Aegean Sea. End of January, and continuing for almost 21 weeks, there was an occupation of the National Opera House by dancers, open to everybody for discussion and debate. They declared “the streets are our stage, revolt is our art”. A lot of actions were linked to the sulphuric acid attack on a striker, Konstantin Kouneva, thrown into her face by by a state-linked fascist just before Christmas (often fascists openly help the cops and are a part of the State; they even openly threw tear gas at demonstrators alongside the cops). This cleaner was the leader of a strike and almost died because of this attack. The company for which she works is directed by a Socialist Party M.P. Tuesday, March 3rd, 1 o’clock in the morning: after having asked passengers to leave (it was the last stop), some masked and disguised passengers set fire to and burnt the whole train and the fire spread to other stationary trains, causing 16 million euros of damage. The railway company “ISAP” was Konstantina K’s employer, and the group who did this – “The consciousness band” -published a communique citing this. Friday 6th March: activists occupied an “ISAP” station, putting the ticket machines out of action, so making transport free. Saturday, 7th March: the offices of the National Electricity Company, another company which employs the cleaners who are on strike, were burnt and 7 vehicles of this company were destroyed. Before this, the offices had been occupied by demonstrators out of solidarity with K.K., just as had happened with several offices of “ISAP”. There have been a lot of attacks on distributors of commodities – the shops (particularly those selling luxury cars). At the beginning of January, a chain of groceries was attacked and the shopping trolleys were filled with food and other stuff and given to people going about their shopping in the market. But more recently (Sunday 8th March) there was an arson attack on a large supermarket in the south of Athens (Dafni), which was completely destroyed. On 8th March as well, the General Secretariat of Employees (in Kalithea) and the Office of Work Inspection (in Agio Anargiroi) were seriously damaged. During January and February, there were lots of actions on the part of farmers/peasants demanding an increase in subsidies and in pensions and a reduction in the price of fuel. In January they blocked several motorways in Greece for several days, and in Crete they occupied airport runways, forcing the cancellation of several flights. 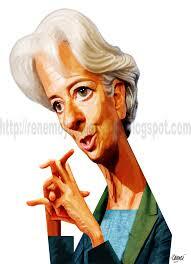 They managed to get an increase of 500 million euros in subsidies, but Crete was not included in this agreement. At the beginning of February, 1000 farmers from Crete arrived at Pireas port in order to do a very slow drive (operation snails-pace) to Athens, but the cops blocked them off and attacked them with tear gas and truncheons; the farmers responded with stones and other missiles, burning dustbins, and attacked the cops with tractors. 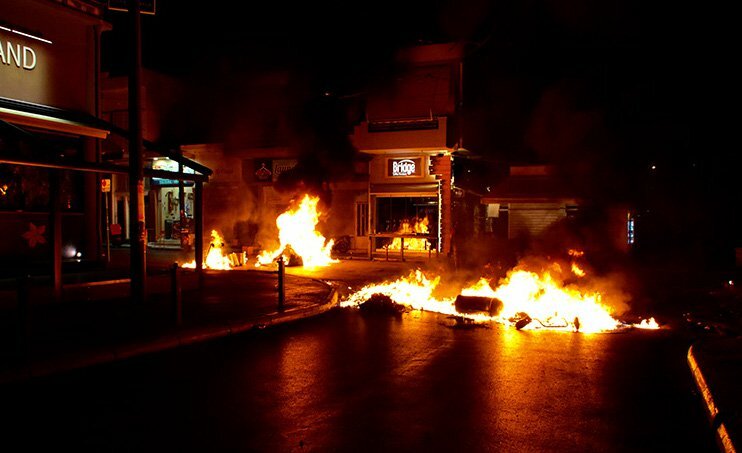 In response to the brutality of the cops, there was a wildcat spontaneous general strike in Crete which lasted several days; all public sector workers left their offices, taxi drivers went on strike, petrol stations and even the shops closed. Farmers occupied 2 offices of the Ministry of the Economy and blocked the Bank of Greece. Tuesday, February 24th: state-linked fascists threw a grenade against a centre for immigrans in Athens, where 2 meetings full of people were being held. By chance, the grenade bounced off the wall and exploded in the street. 2 days later there was a demo asgainst this attack and a large group of anarchists left the demo to attack the offices of a right-wing daily newspaper (which had collaborated with the frascist coup d’etat by the gnenerals in 1967) with a sledge hammer and other things. Several cars belonging to journalists were also burnt. A 2nd demo on March 5th was attacked by cops and there was a large riot. 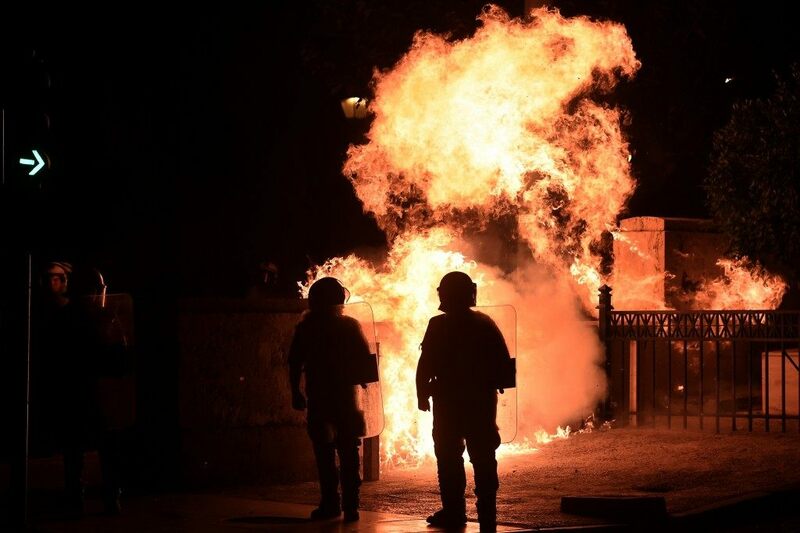 Some banks and some shops for the rich were attacked, and the office of the fascist organisation most associeated with the cops (“Golden Dawn”) – responsible for a lot of attacks against the movement – was completely destroyed by fire. There was also a riot in Salonika that day. Monday, March 2nd in Patras, an Afghani immigrant tried to climb onto the back of a lorry but another lorry behind it had accelerated in order to crush him between the 2 vehicles. He almost died. Given the atmosphere of racist attacks, often supported by the cops, the reaction of more than 1000 Afghans along with other people from the neighbourhood was to construct burning barricades and confront the cops supported by the local fascists. The tear gas and the brutality of the attacks pushed the Afghans to retreat to their ghettoised zone. Later some Greeks from the neighbourhood prevented the state-linked fascists from attacking the ghetto by throwing bottles and other missiles from the balconies onto the amassed fascists below. You have to realise that these fascists from Patra had already killed people opposed to this society. Wednesday, 4th March – some young people assemble at the spot where Alexandros Grigoropoulis was murdered. They tried to prevent the construction of a building to the side of this site by attacking construction vehicles and by burning and destroying a big bulldozer. The cops attack with tear gas. Something similar happened at the end of January and at the beginning of February when some people occupied one of the rare parks in Athens, a park where the mayor wanted to get a private car park built. They built some barricades and attacked the bulldozers; the cops attacked with truncheons and tear gas, but the occupiers responded with stones and barricades across the main road, whilst some demonstrators attacked 2 local police stations, which had a reputation for extreme brutality (in the past they’d tortured and raped people who’d been arrested), burning cop vehicles. The occupation of the park continued for several weeks, with parties and discussions in which the whole neighbourhood participated. The high schools movement continues. 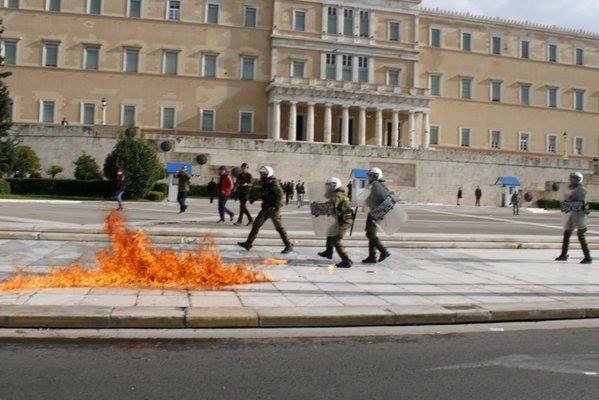 One example: on Friday 27th February, pupils from 2 state middle schools in Athens attacked a private school, reserved for children of the ruling class. They broke one of the entrances and the security guard post, writing up anarchist graffiti, and chucking fireworks and oranges at the school…. 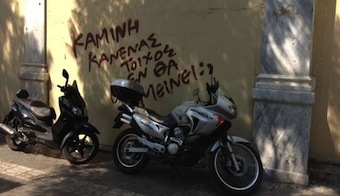 Greece: reflections on some of the contradictions of the movement there (January 2010) Discussion thread on libcom started by me. Worth looking at the entries by taxikipali on this site – there are a lot, and it’s a very eclectic bunch of information which goes up to the last quarter of 2010. 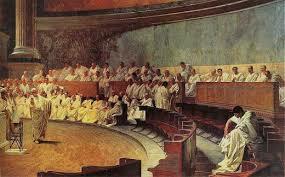 Also check out Thrasybulus. Again, an eclectic collection, but worth sifting through. Minister of Sic (April 2015) This is less about Greece than about the “communisation” milieu from which one of the more prolific of theoreticians of this scene became a minister in Syriza’s government. The Wolf Report: nonconfidential analysis for the anti-investor (2015 )This links to the latest text, but in fact, all of the texts from January to July 2015 are about Greece. Written in a sarcastically witty style, it concentrates mainly on SYRIZA and the ridiculous illusions that people have had in it, as well as aspects of the political economy of the the Greek debt written from a marxist perspective. Its main weakness is a failure to talk at all about concrete examples of the social movement against SYRIZA in Greece, apparently because this comes mainly from anarchists and his blog is intended for marxists, who he assumes are his main readers. Which seems like a narrow perspective, insofar as anyone who wants the development of social opposition should be interested in all proletarian opposition, regardless of the political label that proletarians attach themselves to. On July 14th, the first of the assemblies of workers and unemployed (see entry for 18th July above) was held in Syntagma Square, with just 100 people actively participating. The others in the square were mainly bemused tourists clicking their cameras, and sticking the English-language leaflets in their bags along with their plastic models of the Parthenon and all the other souvenirs. What they made of text like “We spit on the “humanitarian aid” offered to us by local and the international capitalists and the political personnel that represents them. We are not beggars, we do not need them; they are the ones who are still here thanks to our own “humanism” and the coercive labour time that we provide them with.” is anyone’s guess (guesses anyone? I can only think of “I just love those radical leaflets – they’re so genuine Greek”, but I’m sure most of you reading this can think of something better….? ). Added 28/7/15: This is a bit of a parody as certainly young tourists (especially the French and American ones) were genuinely interested in what was going on. 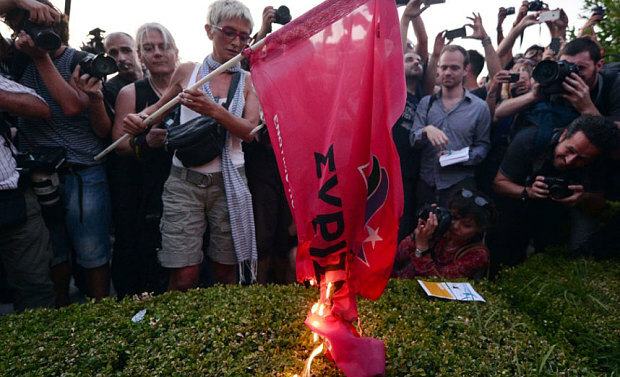 2 days before the 5th July referendum Syriza had amassed 150,000 people in the square to declare their undying opposition to the Troika’s demands. 10 days or so later, and where were these courageous souls? They’d been marched to the top of the hill and then marched right down again. Predictably, those who look to hope from an external force invariably get demoralised by those they’d pinned their hopes on. As a result of this excellent initiative of having an explicitly radical assembly, some of the crowd went off and sabotaged some ticket machines in the metro station, so that people could travel for free. They also occupied the University photocopy place and produced massive amounts of texts for free. On 23rd July self-reduction took the form of 150 or so punks getting on a train to a punk festival without tickets. The director called the riot cops and at the other end they were all arrested. But despite setbacks like this, it seems that there are some fairly spontaneous moves towards the kind of auto-reductions that became popular in 2011 during resistance to electricity hikes and the housing tax added to electricity bills. Meanwhile, our favourite communisator – Woland – resigned, along with Varoufakis, about 10 days ago (mid-July) following Syriza’s about-turn after the referendum. He twittered this brief explanation “I resign because I don’t agree with the new agreement”. This in no way means the guy has even a minimum of integrity – when he was a minister he was already preparing the privatisation of some ports for a Chinese company, and also developing a programme of railway privatisations. Since 40 Syriza MPs out of a total of 150 voted against the new measures, it’s clear that the Syriza ship is heading for the rocks. Though it’s entirely unpredictable how this internal crisis within Syriza is played out, Woland, like Varoufakis, is predictably jumping ship to yet another political career. This, from The Wolf At The Door, about Insurgent Notes – http://thewolfatthedoor.blogspot.fr/2015/07/sasr-syndrome-moves-on.html – is good: “I wish I could say I’m surprised by this lack of insight, the superficiality of analysis, the disavowal of and disdain for the struggle in Greece promoted by Insurgent Notes. I am not. So-called “left communism”can be just as much leftism as anything and anyone else– concerned with its own status, its own credentials, its own package. 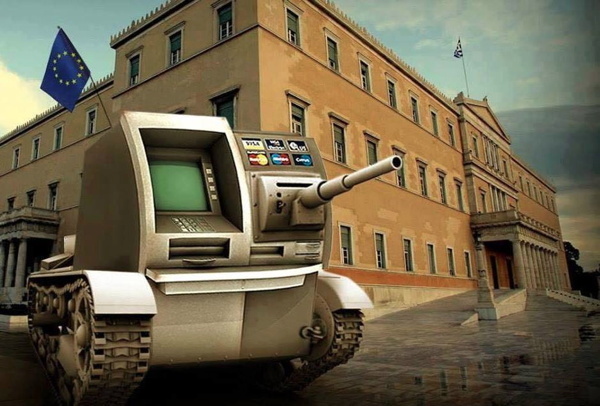 There has been a reversal in Greece. The struggle against capitalism has suffered a defeat. Still, history hasn’t come to an end. It’s not quite yet over in Greece. 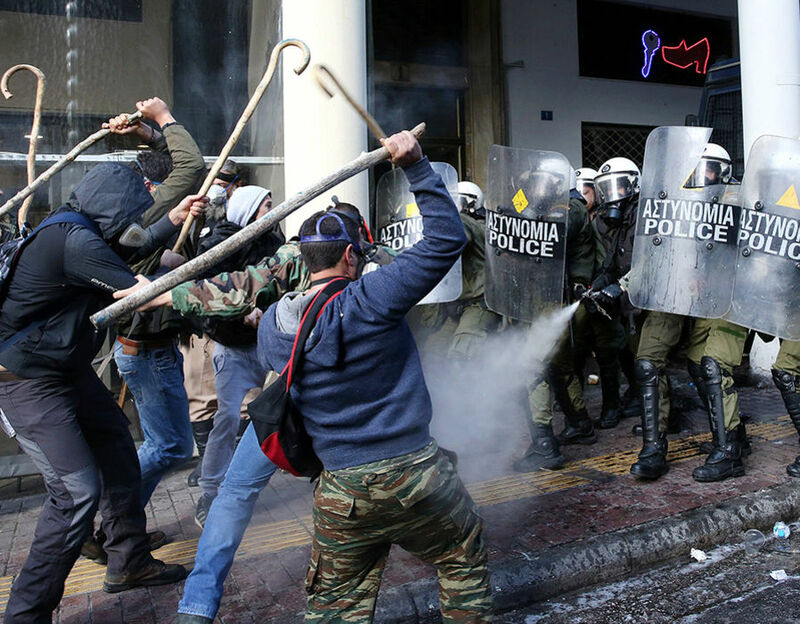 Greece 2015 is not yet Chile 1973. It’s not yet time to move on and plan the next disaster. 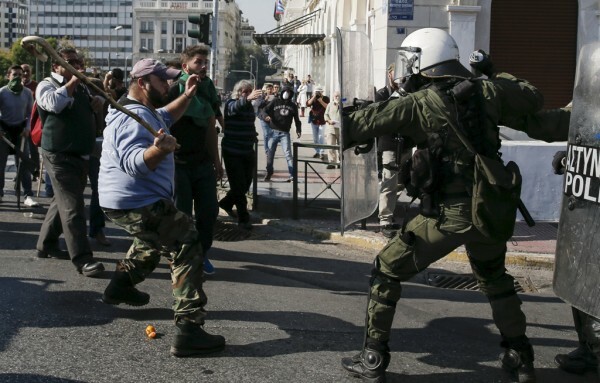 The class struggle in Greece deserves better treatment.